Categories: Determination, Guru, Hard work and Perseverance. Sankar was a handsome young boy. He was also intelligent and of good character. But he was very lazy. He woke up only at 8 o’clock from his bed. Due to laziness he did not attend to his own work. He even expected someone else to carry his schoolbooks. He would have even preferred to have someone feed him his meals! He however scored all right in his examinations despite his laziness, as he was quite intelligent and thus managed to get along in school. Yet he was disappointed that he could not top the class. He nurtured the desire to score really well and pursue a successful medical career. Saying this, Sri Krishna disappeared. Sankar was surprised to hear this. 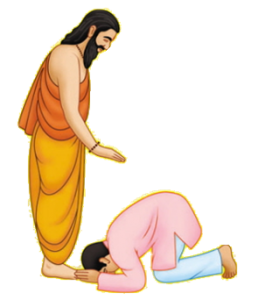 His idea of a Guru had been different. But what was this that Sri Krishna had shown! 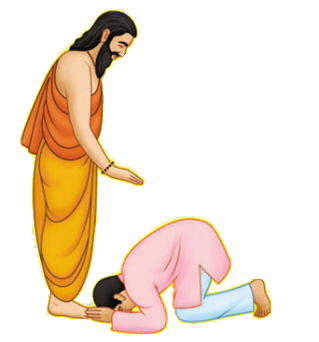 He certainly did not expect his Guru to be a maid! 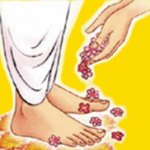 Yet he thought, “If such are the words of God then it should bear some deep meaning in it.” He then began to watch Sarasu. Sarasu would wake up at 5 am. She would sweep, wipe and draw kolam (auspicious pattern) in front of Sankar’s and a few other houses nearby. She would then wash the dishes in these houses and then wash the clothes there. She would eat the breakfast offered in their house and leave to catch a bus to her place of work. She was a construction worker. At the construction site, she would carry cement, sand, etc. all through the day and return home late in the evening. 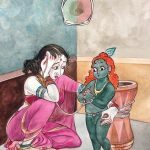 She would attend to her own household work and then return to Sankar’s and the other few houses, where she would once again sweep the floors and wash the dishes. It would be almost 10.30 pm before she laid her head down for rest. And where did she sleep? She slept on the floor without any bed in her tiny hut not far from Sankar’s house. The hut would be warm, stuffy without any breeze and filled with mosquitoes. Yet. she would sleep deeply, ignorant of the mosquito bites! Sankar who watched all this was surprised. For one who labored from morning to night there was no one to offer healthy food. There was no one to even speak kindly to her. People only bossed over her and ordered her to do this or that job, without a single word of appreciation to her. But despite such circumstances she was always smiling with a bright face. 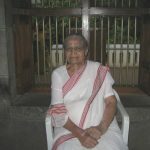 Observing her brought about a great change in Sankar’s life. He began to wake up at 5 am. He did all his work himself. He studied well. His family was wonderstruck at this transformation in him. They were unable to pin down the reason behind this! But only Sri Krishna (and you) know the reason behind this!